Elise Dembowski has constantly been an outsider. She never fits in with any crowd and is constantly teased in school. No matter how hard she tries to be popular, she always ends up being laughed at. When she stumbles on a warehouse party one night, she finally discovers a place where she might fit in, and a passion for something she never knew she had. I loved this book! Elise is such a genuinely good person, but she is constantly ostracized in her high school. She never has the right clothes or interests as far as the popular kids are concerned, so she is always on the outs. I really felt bad for her because she tries so hard to be accepted by the popular crowd, even though they aren’t the type of people who deserve her as a friend. I really loved Elise’s personality and sense of humor and I felt like she would have been the type of person I would definitely have befriended in high school. When Elise randomly comes across a warehouse party in her town, she is surprised that two girls just immediately invite her in and become her friends. I guess this has to do with the fact that they are older, and as I’m sure many of you will agree, things are drastically different after high school. The same boundaries that exist within a high school’s walls seem to not be as present once people grow up and this is evident when Elise becomes friends with a group of college kids. Vicky, a girl who is the lead singer in a band, accepts Elise right away and introduces her to Pippa, a semi-snotty British girl, and Char, the DJ of the club. Char introduces Elise to the world of DJing, which she quickly comes to love. I didn’t like Char from the start. First of all I thought it was kind of pompous that he wouldn’t tell anyone his real name but insisted on going by Char, which is short for “Charming Man”. And while he seemed really interested in teaching Elise how to DJ, the second she started getting good at it and he realized she may be better than him, he started getting jealous and seemed to stop supporting her. He seemed like a player the whole time, and Elise definitely deserved better. I was glad that Elise seemed to always put her love for music first–she knew she was passionate about DJing and she was determined to be the best DJ that she could be. I think this book touched on a lot of important issues that occur in schools. It very accurately depicted the bullying that can occur and a person’s feeling of hopelessness. Elise felt that there wasn’t anything that anyone could do to stop the teasing and she refused to even tell her parents about the torture she received at school. I think this happens to a lot of teens who believe that parents and teachers can’t help the situation, and I think Sales handled these issues particularly well in this book. Overall, This Song Will Save Your Life was an amazing story of self discovery and the struggles that many teens face. I highly recommend this book!! 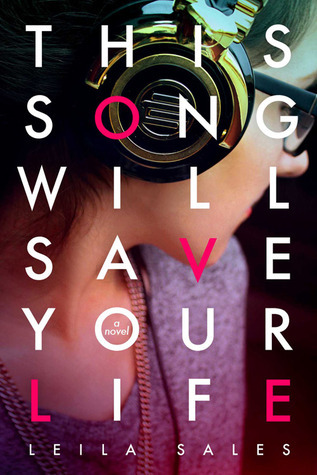 This Song Will Save Your Life will be released on September 17, 2013.